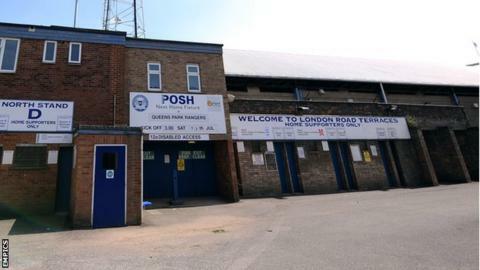 Peterborough United hope to rebuild the London Road End of their ground with an increased capacity of 4,000. Posh had initially planned to give the all-standing terrace a facelift, but will now seek support from Peterborough City Council for a redevelopment. The stadium's Moy's End should open in November after it was rebuilt with financial support from the council. "We're looking to make the London Road End bigger - approximately 4,000 seats," said chief executive Bob Symns. He told BBC Look East: "It would be council-led. It will depend on the money being available for it to be a sustainable end. "The council have to build for the sake of the community. If we can get community projects in that end, it is feasible and everyone benefits from it." The Moy's End redevelopment, which could be open in time for the visit of Swindon on 22 November, has included an education centre, which will be used by the community. Posh are currently top of League One and, should they get promoted, would not be able to use the London Road End in its current condition. Clubs can only use a standing terrace for three seasons in the Championship. Posh would hope to have an agreement in place to overhaul the stand within the next two years.